BPF - Beats Play Free: U.M.M. - Estupidez E.P. 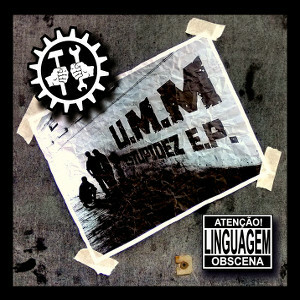 [EN] 7 years after their original debut on Enough, Portuguese oldschool EBM project U.M.M. is back to the releases with a new EP including a bunch of remixes by friend projects Corrosion, Aktivehate, Sci-Fi Industries, Waste Disposal Machine, A.D.A.C. 8286 and Technomader. [PT] 7 anos após a sua estreia na Enough, o projecto Português de oldschool EBM U.M.M. está de volta às edições com um EP que inclui também remisturas de projectos amigos Corrosion, Aktivehate, Sci-Fi Industries, Waste Disposal Machine, A.D.A.C. 8286 e Technomader. Labels: EBM, ELECTRONIC, electronica Portugal, Enough Records, U.M.M.